What’s in a Semester Abroad, Anyway? …which translates to: Hi from Copenhagen! My name is Iris and I’m currently spending my junior fall studying abroad in Copenhagen, Denmark. I’m taking classes at the Danish Institute for Study Abroad (DIS), where I’m focusing on my Biology major, particularly through the Medical Practice & Policy program. Up until last spring, I didn’t really understand what spending a semester abroad was like and why people would choose to do it — I mean, why leave the happy life I have at Swat and throw myself into the unknown lands of Scandinavia?! Well, first, that’s a silly way of thinking, but also, studying abroad opens up your opportunities to learn about the world and to learn about yourself, too. So, you ask, what’s in a semester abroad, anyway? This semester, I’m living with a Danish host family! I nearly skipped the words “Danish” and “host” because to me, they’ve become so close to me that they’re simply that — my family. 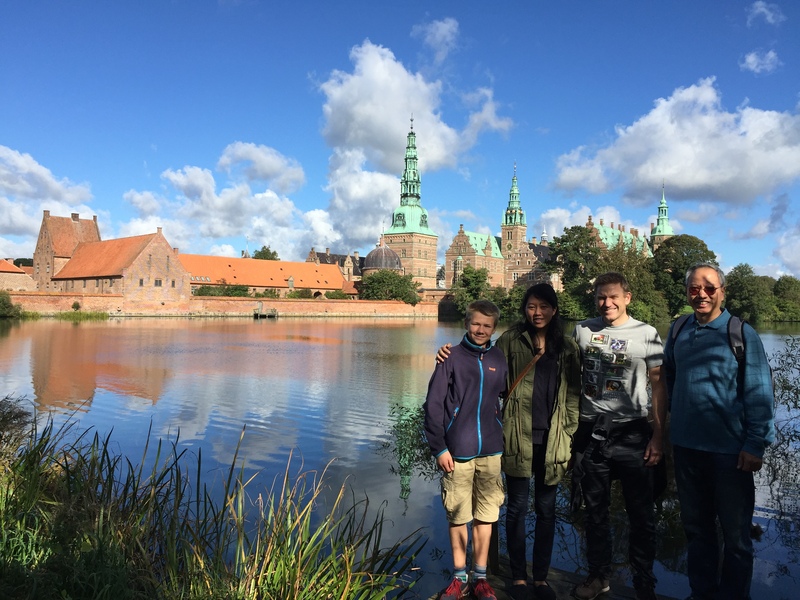 I chose to live in a homestay because I think it offers the most real experience of living like a local in a new country — I’m surrounded each day by my host siblings (I have two younger brothers and a younger sister) instead of other American students, and I bike in true Danish fashion. Plus, nothing beats coming home to yummy food or going on cultural adventures with your hosts! In fact, I just got back from a trip this afternoon to the Louisiana Museum of Modern Art with my Danish grandparents! One of the neat aspects about DIS is that we are taught by professors who work in the field that they teach. Most work as professionals in the areas they teach — for example, my Medical Practice & Policy class is taught by an ophthalmologist and a neurologist, my Complexity of Cancer class is taught by two oncologists, and my Social Neuroscience class is taught by a psychologist! We also get a lot of hands-on experience, especially with my medical class! This is probably the best part about the learning environment here. It’s true that I miss the level of intellectual conversation from my Swatties, but learning by doing and learning by experiencing is something that really makes my semester here so transformative. My classmates and I were learning how to suture as part of the four rotations on one of the days in our medical class. We also learned how to insert an IV, develop the skills to do a laparoscopic surgery, and use an ultrasound (while actually looking for organs in each other!). This is by far one of the coolest classes I’ve ever had!! In addition to experiential academic learning, we have field studies with our classes where we go to the public spaces of Copenhagen and apply our knowledge from the classroom to the actual concepts we’ve been studying. Our Wednesdays are free so that we can fit field studies from different classes throughout the semester into our “free days”. One week, I went to the Design Museum of Denmark with my Danish Design class to study the various chairs, lamps, and silverware of famous designers in person! Part of our program schedule is also set aside for travel. We have three weeks built in to our semester for travel, whether that’s traveling with one of our classes or free travel with friends! 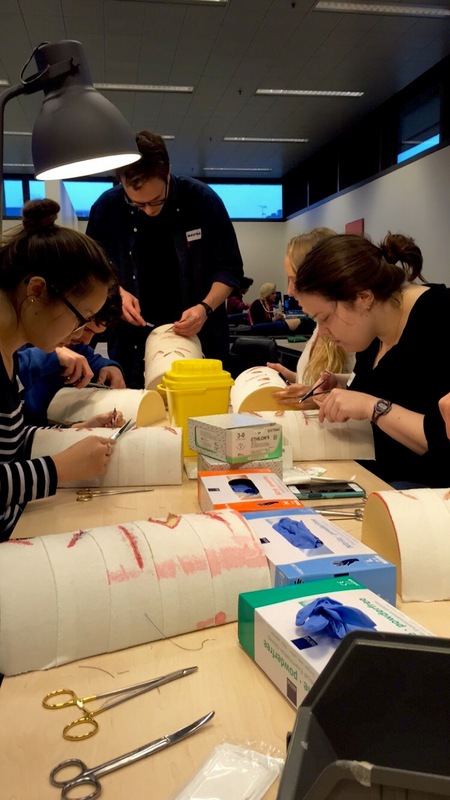 My medical class traveled to Western Denmark as well as Stockholm, Sweden, and Tallinn, Estonia, to visit doctors and hospitals and to learn about the health care systems of three strikingly different countries. In a week, I’ll be in Paris with my art history class to study the paintings of the Impressionists! 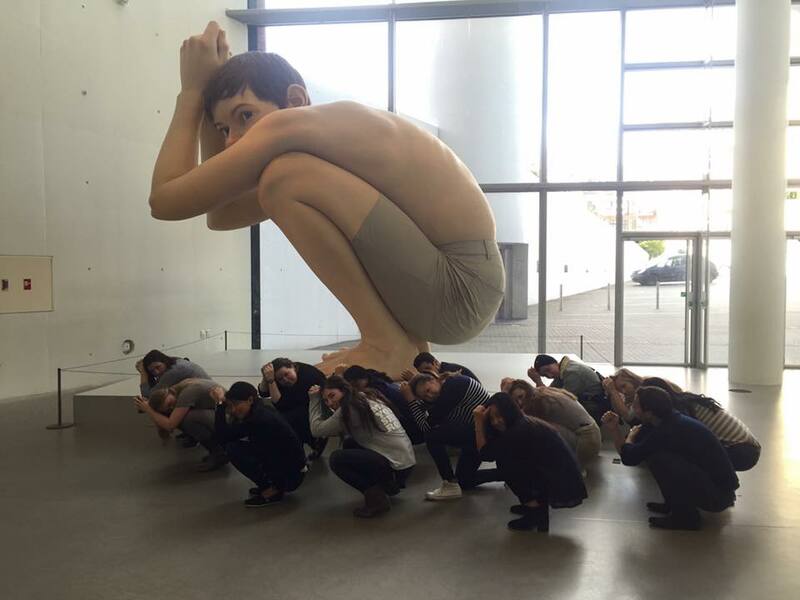 My medical class poses in front of ‘Boy’, a sculpture in the ARoS Museum of Art in Aarhus. This was one of the places we stopped at after our tour of Western Denmark! Like ‘Boy’, I came to Denmark a little scared of what was to come, but I’ve learned a lot about cultural immersion, personal growth, and what kinds of things I want to be doing further down the road. Often, going to a new country means learning a new language – for me, that means learning Danish. I’m slowly picking up on the daily things like reading newspaper headlines or cafe menus after three months of Danish Language & Culture! I’m also taking two design theory/art history classes that I wouldn’t be able to take elsewhere: Danish Design and Impressionism in Paris. These are such great classes that build on my liberal arts education and help broaden my intellectual curiosity beyond just being a boxed-in science nerd — many thanks to Swarthmore for giving me this strong foundation of interdisciplinary learning! 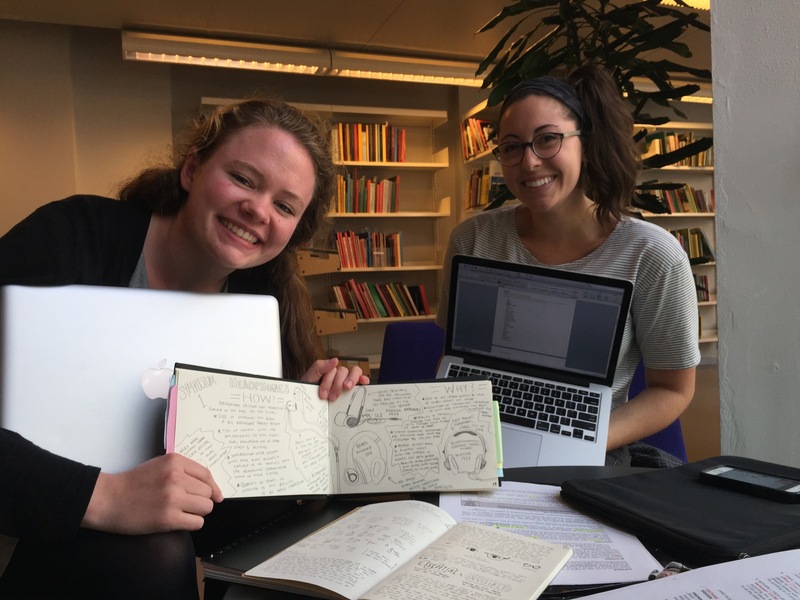 Two of my friends from my Danish Design class proudly showing off our final project notebooks in progress! Wow. Bold statement. I don’t actually have it all figured out (because no one does), but my point is that this semester has really helped solidify what I want to do after graduation. Originally, I wasn’t planning to study abroad, since I thought that I wouldn’t be able to balance pre-med requirements with a semester away. However, Swarthmore’s Office of Off-Campus Study really helped me to ease the seemingly tricky parts of studying abroad as an aspiring medical student, and I’m so happy it worked out. Since the start of this semester with my core class, I’ve learned how to perform medical procedures and diagnose diseases from diabetes to vitreous hemorrhages. The incredible opportunities of learning alongside doctors combined with the depth of cultural and academic exploration has given me a lot of insight into what I think I would enjoy doing in my future. Most importantly, studying abroad has make me appreciate how special my experiences at Swarthmore and beyond truly are! 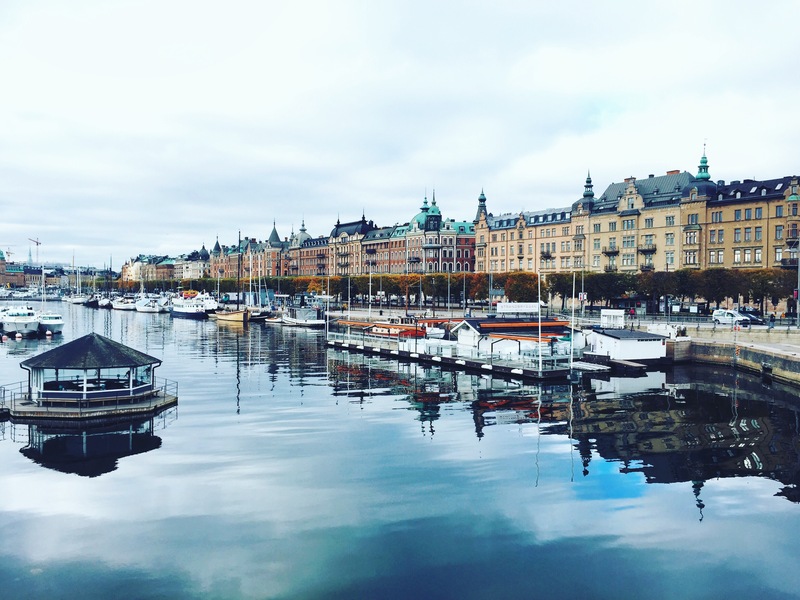 Along one of the canals in Stockholm while on the study tour with my medical class!